Api Hemara, Five Rings Dojo’s most experienced fighter, will fight for the no.1 contender position in the middleweight division at the next XFC on July 20 in Brisbane. Api will face Taipari Rikihana from Impact Gym in Brisbane. Api is an exciting striker with solid wrestling and BJJ. He won his last fight in the main event bout of Cage Wars in december 2011 by submission. Although his last fight was one and half years ago, he has been training the whole time and adding new elements into his fight game. XFC are awaiting confirmation for Api’s opponent and we will release the details as they come to hand. 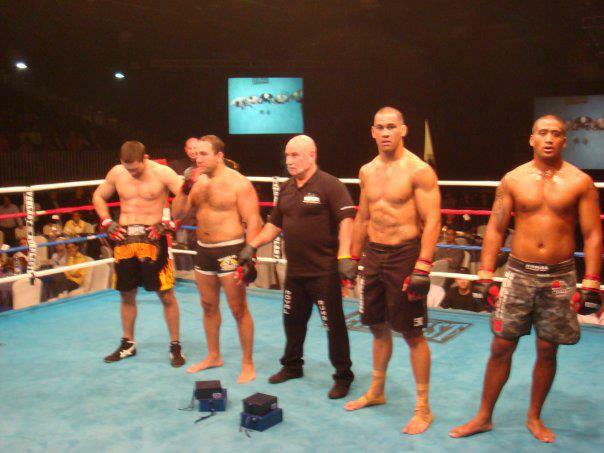 Below is a pic of when Api fought a tag team MMA Match with James Tehuna against two Russians in Dubai.